Vladimir Putin: Colleagues, friends. Allow me to open the expanded meeting of the SCO Heads of State Council, which is being attended by representatives from the observer and invited states and guests and delegates from international organisations. I am asking you to look at the agenda again and to approve it, unless there are any additional comments in light of the results of the limited attendance meeting of the SCO leaders. No comments? Thank you. The agenda is approved then. Let's get started. But first I'd like to say a few words on behalf of the Russian delegation. The Ufa summit will conclude Russia's SCO Presidency this year. It was aimed at the further strengthening of cooperation in all spheres of activity and at bolstering the potential and prestige of our organisation. In all, we held about 80 various events in 2014 and 2015. A package of important documents has been prepared for the Heads of State Council meeting. One of them is the Ufa Declaration, which reflects our shared vision and consolidated views on the situation in the region and the rest of the world, the results of Russia's Presidency and guidelines for our future work. The SCO Development Strategy towards 2025 has been submitted for approval. It outlines practical cooperation goals for the next decade. We also intend to sign a new agreement on border issues and a programme of cooperation in combating terrorism and drug trafficking. Colleagues, our summit today has opened a new page in the history of SCO development. For the first time since its establishment, we have launched a procedure for admitting new members - India and Pakistan. We have agreed that the status of the Republic of Belarus in the SCO will be upgraded to observer. In addition, Azerbaijan, Armenia, Cambodia and Nepal will join the family of SCO nations as dialogue partners. I'd like to add that several other countries have expressed interest in joining our organisation in one form or another. We will consider their applications carefully and with due regard for our requirements. One of the SCO's unchanging priorities is security in the SCO area and on its external borders. The aggravating situation in Afghanistan is of great concern, where an international military presence for ten years has not been able to bring significant improvement. The crisis is getting even worse due to the growing activity of the so-called Islamic State, a terrorist organisation that is seeking omnipresent influence. My colleagues and I have agreed to expand our coordination at the defence ministerial level for a more efficient monitoring of the situation and negotiating collective action to eradicate potential threats. We have also agreed to continue the practice of annual counter-terrorist drills. Terrorism and extremism receive substantial funding from the drug trade in Afghanistan. According to our estimates, opium poppy cultivation increased by 7 percent in 2014, while the production of opiates has reached 6,400 metric tons (with 5,500 metric tons in 2013). We believe we have come to the point when it is necessary to establish a working group on fighting drug sales that are related to the funding of terrorism, within the Regional Anti-Terrorist Structure. Colleagues, we put special emphasis on further expansion of trade and economic cooperation within the SCO. It is obvious that together we can be much more resistant to crisis developments in the global economy and in finance, and more easily overcome various restrictions and barriers. It is very important to develop cooperation on food supply, transport, energy and finance security. We are willing to work closely on linking two integration processes, the Eurasian Economic Union and the Silk Road Economic Belt. The initiative to create an SCO integrated transport system, including the potential of the Trans-Siberian and Baikal-Amur railway lines in Russia, has good prospects. It is important to make the SCO Energy Club's activity more practically oriented. We welcome the active involvement of the business communities of our countries in promoting practical cooperation. Our organisation's Business Council is designed to play an important role here. Further cooperation in the financial sphere is one of our priorities. We are working to establish the SCO Development Bank and Special Account. The idea of establishing an international project financing centre at the SCO Interbank Consortium seems to be highly promising. It is essential to take full advantage of the existing regional financial institutions: the Eurasian Development Bank and the Asian Infrastructure Investment Bank in addition to the emerging BRICS New Development Bank. We also have some big head starts in humanitarian cooperation. The SCO Youth Council has a lot to offer, putting forward the idea of the SCO Youth Card to facilitate youth travel in the region. I'm sure that this project will allow our young people to interact with each other. We take a positive view of the March agreement to draft a programme to promote cooperation in tourism. The SCO Network University project, which integrates 69 universities in the SCO countries and four from Belarus, is being successfully implemented. We hope that an intergovernmental agreement on establishing it will soon be signed and adopted. Dear friends, the Ufa summit is being held 70 years after the end of World War II. In this connection, I'd like to once again express our gratitude to our partners for attending the May celebrations of the 70th anniversary of Victory in the Great Patriotic War. It is notable that the leaders from all SCO member states attended the Moscow celebrations. We regard with reverence the heroism of our people and will do everything possible to prevent a repetition of that tragedy which put the world on the brink of extinction. This approach has been sealed in a joint statement on the 70th anniversary of Victory over Nazism, which we'll adopt today. I'd like to add that we'll attend celebrations for the 70th anniversary of Victory over Japan in Beijing in September, at the invitation of our Chinese friends, and President Xi Jinping personally. Colleagues, today the SCO Presidency will be transferred from Russia to Uzbekistan. I wish President Islam Karimov successful and productive work as the next president of our organisation. Russia will certainly do its best to provide overall assistance to our Uzbek colleagues. Thank you for your attention. Colleagues, I ask you to speak on the issues on our agenda. The first speaker will be President Nursultan Nazarbayev of Kazakhstan. Nursultan Nazarbayev: Thank you, Mr Putin, for giving me the floor and for the excellent conditions that Russia has provided for our work at this meeting. Ladies and gentlemen. At this alarming and demanding time for the entire global community, the Shanghai Cooperation Organisation is facing a serious challenge to its endurance and resiliency. I believe the summit in Ufa will be a breakthrough in our efforts to overcome today's unprecedented threats and challenges. We are just entering the next stage in the organisation's development: the further growth of its influence and prestige on the world stage. Along with other positive examples, this is indicated by simultaneous progress in the two strategic SCO tracks. First. Since the very beginning, the Shanghai process has asserted itself as a transparent, balanced, multilateral group. In this context, we fully support the decision to launch the accession process for India and Pakistan. The international authority, experience and economic potential of India and Pakistan would be a huge support to the future prospects of this organisation. Second. The signing of the SCO Development Strategy Towards 2025 is a remarkable example of how this forum is evolving and improving. The strategy is a cornerstone of the Shanghai process for the next ten years. In light of current global events, the SCO must remain a guarantor of stability, security and prosperity in the region. Without exaggeration, during this historic period, our duty is to present the SCO's united and unshakable spirit to the world. Distinguished colleagues, since the beginning of the 21st century, the number of terrorist attack victims has increased five times and reached some 150,000 people. Over 80% of the cases occur in Asia, the Middle East and Africa. Almost 70% of inhumane crimes against civilians and peaceful nations have been carried out by four organisations: Daesh, Boko Haram, the Taliban and al-Qaeda. These figures represent a serious threat to the wellbeing of our countries and peace and security in the region. The ideology of today's evil forces, their goals and the means of achieving these goals are basically at odds with the canons and philosophy of all religions without exception. Our citizens' involvement in combat operations on the side of terrorists is becoming a serious problem, so there is a pressing need to develop an integrated international plan for countering this threat. The SCO should make its contribution to promoting dialogue between members of the international community who are ready to fight violent extremism. So, it would be essential to put this issue on the agenda of the upcoming UN General Assembly session to create an integrated global antiterrorist network. I hope that the adoption of an SCO programme to fight terrorism, extremism and separatism will become a convention in the fight against terrorists and a starting point for a common cause. Our efforts should be focused on consolidating the international community along the following lines: promote international cooperation to eradicate terrorism financing sources and provide a solid legal framework for the identification and seizure of terrorist assets. It is essential to support UN efforts in developing a plan of action to prevent violent extremism. International experience shows that the costs involved in forecasting natural disasters and making preparations for them are one fifteenth of the costs involved in dealing with their consequences. In this context, Kazakhstan proposes adopting an array of pre-emptive measures and formulating an SCO concept regarding sustainable development and preventive measures to avert such threats. To tap the economic potential of the participants in the Shanghai process, it is essential to speed up the integration of the SCO space into the international transport and logistics system. There is no doubt that this will benefit all, including Asia, Europe, the Middle East and Africa. The implementation of the new economic programme, the Chinese initiatives (the Silk Road Economic Belt), as well as the favourable conditions that are being created within the Eurasian Economic Union, are all in keeping with SCO goals. Taken together, this will help us achieve one more ambitious goal - the creation of a macroeconomic space for complementary development in Central Asia. To launch the SCO economic track, we need to continue to search for compromises. The Asian Infrastructure Investment Bank has great potential as a common platform for the implementation of economic projects. The SCO must strictly comply with the principle of openness and maintain its attractiveness. Azerbaijan, Armenia, Belarus, Iran and Turkey have expressed a desire to be a part of the organisation. I believe that we should provide our assistance to them and consider their applications carefully and gradually within the framework of the SCO concept so as to strengthen rather than weaken our organisation. Dear friends, the SCO agenda includes several acute security issues. We must focus our attention on involving Afghanistan in regional integration, promoting economic and cultural cooperation with it and upgrading the infrastructure projects that constituted the foundation of the Afghan economy in the past. We believe that there is no alternative to a peaceful settlement of the Ukrainian conflict. Kazakhstan is ready to continue to contribute to resolving this problem and bringing the sides closer together. The situation in the Middle East remains tense. We are very worried about Syria, Yemen, Libya and Iraq. The Palestinian-Israeli conflict has not subsided. These events are the result of a global shift, including a new phase of the global economic crisis. I'm sure that the SCO member states will contribute, relying on their will for unity and commitment to the Shanghai spirit, to ensuring international peace, security, sustainable development and cooperation. I'd like to point out that Tehran is a major element in the system of regional and international security, as well as in the system of our trade and economic ties. We hope that Iran's talks with the group of international mediators will end soon with the signing of a comprehensive agreement on Iran's nuclear programme. Ladies and gentlemen, in conclusion I'd like to congratulate President Islam Karimov of Uzbekistan on taking over the rotating SCO presidency. We will provide overall assistance to him. I wish our Uzbek partners productive work in their new capacity. I also confirm Kazakhstan's willingness to contribute to our combined efforts towards strengthening and further developing the SCO in accordance with its goals and tasks. I will now give the floor to President Xi Jinping of China. Xi Jinping (via interpreter): Esteemed President Putin, esteemed colleagues. I am very pleased to be attending the SCO summit in the beautiful city of Ufa. President Putin and Russia as the country holding the rotating presidency have done a great deal of constructive work to promote diversified cooperation within the SCO framework. The Chinese side appreciates this. Since last year's summit in Dushanbe, the SCO member states have cooperated closely and supported one another for reliable security and stability in the region, and have enhanced the level of trade and interaction. The SCO's appeal and its binding power are constantly growing. At the same time, due to internal and external factors, there are difficulties and challenges to regional security, stability and economic development. Furthermore, the external environment provides no cause for optimism in SCO development. We need to step up our practical efforts to forge ahead towards new breakthroughs. First, in keeping with the Shanghai spirit, we need to create a shared-destiny community in the region. We will continue to be guided by the Shanghai spirit, consistently follow the SCO principles in international relations, uphold international justice and equality, promote multilateralism and openness, respect each other's interests, not interfere in the internal affairs of other countries, resolve disputes by peaceful means and promote development and prosperity in the spirit of mutual progress. Let the Shanghai spirit become a foundation for the SCO member states in forming a shared-destiny community and a large harmonious family. This year, the UN will turn 70, and 70 years ago, victory in the world war against Nazism was won. Allow me, on behalf of the Chinese, to pay tribute to the memory of the fallen heroes who courageously fought in World War II for the just cause of humankind, and express sincere gratitude to the countries and our foreign friends who helped the Chinese people in the fight against Japanese military aggression. Second, it is essential to strengthen our viability and create a solid security wall in the region. It is important to intensify political contacts and coordination, develop effective response measures and jointly defend the security of governments, political systems and social stability in all of the SCO member countries. It is also necessary to strengthen security cooperation with Afghanistan, help the Afghan security forces increase their combat capability and play a bigger role in promoting national reconciliation in Afghanistan and rebuilding the country's economy. We should take effective action to develop cooperation in the fight against terrorism and drug trafficking, as well as in defence, and put in place a wide-ranging and comprehensive system of cooperation among our law enforcement agencies. It is essential to speed up the creation of a centre to respond to security challenges and threats via the Regional Anti-Terrorist Structure and strengthen the organisation's drug control functions. China welcomes the signing of the SCO agreement on cooperation and interaction on border issues and is ready, in conjunction with all parties, to speed up the drafting of a convention to combat extremism. Third, we need to open the potential for cooperation and expand the scope of practical collaboration. It is necessary to take bigger steps towards expediting and liberalising trade and investment. China for its part is willing to strengthen cooperation with all countries, carry out priority projects of all-inclusive interaction approved by general consensus, arrange financial support for feasibility research and design, and participate in joint investment and credit projects related to construction and design initiatives. It is important to form a cooperative scenario for the region within the next few years, which will include a 4,000-kilometre railway and over 10,000 kilometres of motorways. With regard to production collaboration, China has reached an understanding with Kazakhstan and other countries. That said, we assume that the member states could use the related advantages and engage in joint production based on equality and mutual benefit for trading their products on the international market. China is willing to assist in creating collaborative production parks in each of the SCO member states in accordance with market regulations, and to expand cooperation in production capacities. The SCO New Development Bank is a strategic measure for promoting multilateral cooperation. We must consistently follow this course and as soon as possible create our own financial instruments within the organisation. At this point, China is ready to satisfy the investment demands of the SCO members by means of the Silk Road Fund and the China-Eurasia Economic Cooperation Fund. At the same time, China will be providing technical assistance to the member states in industrial planning, feasibility research, consulting and so forth in order to expand the opportunities of the interested parties. It is necessary to bolster contact and exchange in energy policy, develop specific measures to ensure the security of trans-national oil and gas pipelines. It is important to continue expanding agricultural trade, improve cooperation in farming, forestry, animal breeding and fishing to ensure food security. China proposes developing a programme for research and design partnerships within the SCO, accelerate the development of an environmental data exchange framework. We are ready to work with our partners to identify the role of the SCO Business Council and the SCO Interbank Consortium. We hope that the construction of the Silk Road Economic Belt and national development plans of the SCO members will be complementary. We will work together with the interested parties to successfully integrate the Silk Road Economic Belt and the Eurasian Economic Union in favour of balanced development in Eurasia. Fourth, we must promote the spiritual rapprochement of our nations and strengthen their centuries-long ties of friendship and neighbourliness. To strengthen ties between our young people, China will launch a five-year programme of SCO youth exchange camps in 2016. They will accept 200 young people from the SCO member countries every year. By 2018, China will implement its initiative on a summer camp for 2,000 schoolchildren from the SCO. We are ready to share China's huge tourism potential with the SCO member states. We hope that Chinese tourists will be offered opportunities for eased visa requirements. China supports the goal of strengthening cooperation in the spheres of natural disaster relief, prevention and treatment of infectious diseases, and travel. We are ready to discuss cooperation in Chinese medicine and visa and labour permit facilitation with any interested country. Fifth, we must carry on the tradition of openness and mutual enrichment and continue to strengthen our organisation. After this summit, we will launch a procedure for admitting the new members - India and Pakistan. We welcome contributions from Belarus as observer state and from Azerbaijan, Armenia, Cambodia and Nepal as dialogue partners. China believes that the admission of new full members will provide an additional impetus to SCO cooperation in all spheres. At the same time, we should encourage the development of the organisation's external ties and strengthen our cooperation with the observer states and dialogue partners. We should improve available mechanisms for dialogue and cooperation, so that the observer states and dialogue partners have more opportunities for sharing the fruit of SCO development. In conclusion, I'd like to congratulate President Karimov on assuming the rotating presidency of the SCO Heads of State Council and to assure him of our assistance in organising an SCO summit in Uzbekistan next year. Thank you. Vladimir Putin: Thank you Mr President. I will now give the floor to President Atambayev of Kyrgyzstan. Go ahead. I would like to join my colleagues in thanking Russia for its hospitality and excellent organisation of today's meeting. I would also like to praise Russia for its large-scale efforts in preparing the summit. Distinguished participants, the Ufa Declaration stands out among the important documents that are to be signed today. It is my belief that this document fully reflects our shared commitment to further strengthening mutually beneficial cooperation and outlines the unified perspective of SCO member states on topical regional and international issues. Distinguished participants, today's summit opens a new page in the Shanghai Cooperation Organisation's history. Today, we will sign a historic decision to launch the procedure to expand the organisation. The Kyrgyz Republic supports the decisions to launch procedures for India's and Pakistan's accession to the Shanghai Cooperation Organisation. The Kyrgyz Republic also welcomes the decision to grant Belarus observer status, and designate Azerbaijan, Armenia, Nepal and Cambodia as SCO dialogue partners. I believe that these steps will significantly enhance the organisation's political and economic potential. I think that the launch of the SCO expansion process will create a new political and economic environment within the organisation. In this respect, the issue of making sure that the organisation adapts to the new environment comes to the forefront. With that in mind, the SCO Development Strategy Towards 2025, which is expected to be adopted today, is regarded as a key document outlining the SCO's activities for the next decade. Colleagues, this year is marked by the 70th anniversary of Victory over Nazism in World War II and the 70th anniversary of the United Nations. In the statement on the 70th anniversary of Victory, the Great Victory, we highlight the importance of learning the lesson of this immense tragedy and combining efforts to preserve peace, which is becoming increasingly fragile by the day. As you know, security issues were essential when the SCO was established. It is my belief that they should remain a priority, not least as since last year's meeting, in just one year, the situation in the region and in the world has changed dramatically. New hotbeds of instability emerged, and radical extremist organisations have become even more rampant. In this regard, there is no doubt that the SCO should step up efforts to enhance security. As before, the Kyrgyz Republic is interested in a peaceful and stable Afghanistan and welcomes efforts by the Afghan government to promote stability, democratic reforms and implement a national development plan. Let me reiterate that drug trafficking is one of the potential threats to the stability and security in the region. The fact that we came here to adopt a statement on drug trafficking and commit to drafting an SCO convention on fighting extremism shows that we stand ready to continue and strengthen joint efforts within the SCO. Distinguished colleagues, the SCO Development Strategy, which we are endorsing, emphasises the strengthening of mutual trust and neighbourly spirit as one of its basic goals, which should transform the state borders into areas of lasting peace and friendship. We regard the agreement on cooperation on border issues, which is to be signed today, as an important step in this direction. Let us recall that during last year's SCO summit in Dushanbe, Kyrgyzstan advanced an initiative for Central Asian countries to draw up and sign bilateral agreements on confidence-building in the border areas. The first such agreement, between Kyrgyzstan and Kazakhstan, has been signed and ratified already. I hope that our other neighbours will support this initiative. Distinguished colleagues, the development of fruitful trade and economic cooperation is certainly among the key components of stability and security. That is why we insist that our agreements be implemented as soon as possible. In this context, we regard the establishment of an independent SCO financial agency to provide financial support for feasibility research and design and fulfill the programme of economic cooperation among the top priorities. I think we should give strict instructions to our governments to come to a consensus and ultimately coordinate the establishment of the SCO Development Bank and Development Fund, and make real progress towards this goal. We are also sure that the joint implementation of China's initiative for the Silk Road Economic Belt will promote trade and economic cooperation within the SCO. Ladies and gentlemen, I would like to note in conclusion the efficiency of Russia's SCO Presidency. Due to its proactive work, the organisation made its first-ever landmark decision on launching the procedure for SCO expansion. The organisation is gaining in strength and dynamism. I would also like to wish President Islam Karimov of Uzbekistan fruitful and successful work as his country is taking over the SCO Presidency. Thank you. Vladimir Putin: Thank you very much. President Rahmon of Tajikistan has the floor. Emomali Rahmon: Mr Chairman, colleagues, ladies and gentlemen. First, I would like to express deep appreciation to Russian President Vladimir Putin for the high level of organisation of our meeting and its traditional hospitality. Colleagues, our summit takes place in the year of the 70th anniversary of the end of WWII. The heroic deeds of those who gave their lives for the Great Victory urge us to be careful and boost our unity in promoting peace and sustainable development. Only through remembering our past can we build our future. Peace is priceless, and our common goal is to preserve and protect peace and stability in the SCO region and continuously increase its contribution to securing peace in the world. It is important to enhance our joint efforts in combating the three evils, resolutely rebuff the existing challenges, and be prepared to face new threats. Insofar as providing security to our countries is the main concern, we attach great importance to the coordination of joint efforts in implementing the programme for cooperation between SCO member states in combating terrorism, separatism and extremism. In the forthcoming period, we must pay particular attention to the younger generation. The youth of today live in a world of global diversity, new technologies, and scientific and technological progress. At the same time, we should recognise that the global economic crisis hit the youth the hardest. Our younger generation deserves to feel confident in the future, and we must make every effort to achieve this. In this regard, our main aim should be to prevent youth involvement in various extremist and radical movements. Working with, and for, young people should become one of SCO's priorities. I propose deeming one of the upcoming years the Year of the Youth. This will allow us to develop new and more efficient mechanisms for getting young people involved in the implementation of constructive joint plans, particularly the SCO Development Strategy towards 2025. The Strategy we are adopting today is an exceptionally important document, with its spirit and goals comparable only to the SCO Charter. The document reflects our common aspiration in making the SCO a strong organisation as well as an important player in the system of international relations, serving the cause of peace, security, and economic and social progress in the region. In this interdependent world, the SCO should respond quickly and adequately to the challenges and threats of extremism, terrorism, cross-border organised crime, drug trafficking, and cybercrime. No country alone can deal with these acute global threats, as participants in the international conference on the drug threat, held in Dushanbe in late May of this year, reaffirmed. We believe that the results of the conference could be used to formulate an SCO Anti-Drug Strategy for 2017-2022 and should be forwarded to the participants of the UN General Assembly Special Session on Drugs. We are convinced that coordinating joint efforts with Afghanistan in the fight against drugs, as well as on other important issues, remains a crucial element of the SCO. The friendly Islamic Republic of Afghanistan is now in the midst of an exceptionally important stage in its development. We are sincerely interested in helping the Afghan people firmly and irrevocably take path of peace, national accord, and revival. Tajikistan will continue to make a practical contribution to the rehabilitation and development of this neighbouring state. We also hope that political and diplomatic solutions will be found to the acute on-going crises in some countries of the Middle East, North Africa, and in Ukraine. The SCO is a unique organisation that has proved its worth and has won international respect. Tajikistan wholeheartedly supports the decision to launch the procedure of admitting India and Pakistan into our organisation in keeping with the SCO principle of openness. We hope that the Islamic Republic of Iran will also become a full member of the SCO soon. We also urge the strengthening of the institute of observer countries and welcome the granting of this status to Belarus. We note with satisfaction that new countries have been added to the group of SCO dialogue partners - Azerbaijan, Armenia, Nepal, and Cambodia. The valuable proposal made by President Xi Jinping of China regarding the founding states of our organisation merits close attention. The complex processes unfolding in the world and in our region necessitate the pooling of efforts to promote collective approaches towards resolving regional problems, especially economic problems. Tajikistan supports the moves aimed at expanding mutual trade and investment, the creation of the SCO Development Fund and Development Bank, the invigoration of cooperation in agriculture, and the improvement of the transport and logistics system. Tajikistan was among the first countries to ratify an agreement on the provision of a favourable conditions for international surface freight. I consider it important to reaffirm our readiness to contribute to the formation of the Silk Road Economic Belt. We believe that it has great potential for expanding trade and economic cooperation in the SCO space. In this context, regional contacts, as well as small and medium-sized businesses, can become a driver of innovative development. It is essential to fully tap the creative potential of our people. The SCO Business Council and the SCO Interbank Consortium could develop effective mechanisms for supporting private enterprise and submit their proposals for consideration by the Council of the SCO Heads of Government. Esteemed colleagues, we believe that the Russian Presidency not only has ensured the continuity of the SCO's activity but has also provided it with an additional impetus. By adopting our strategy, we have acquired a roadmap for SCO development for an entire decade. In 2016, we will meet in Tashkent. In a certain sense, it will be an SCO jubilee summit as we will mark our organisation's 15th anniversary. There is no doubt that Uzbekistan's Presidency will help stay the course toward making its activity more creative and practically oriented. In closing, I believe it is important to note the consistent and efficient efforts of the SCO executive bodies, led by Secretary-General Dmitry Mezentsev and Regional Anti-Terrorist Structure Executive Committee head Zhang Xinfeng. As their terms in office expire on December 31, 2015, allow me to thank them for their major contribution to the cause of strengthening our organisation and wish them success. Tajikistan is grateful to the SCO member countries for supporting our candidate Rashid Alimov for SCO Secretary-General. We hope that the active work of the Tajik representative will help further invigorate the activity of our organisation. Tajikistan is ready to work with the SCO member countries in the interest of meeting the goals set forth in the Development Strategy. The key to our common success lies in the Shanghai spirit, in consolidating our friendly, good-neighbourly relations and mutually beneficial cooperation aimed at improving our peoples' living standards and guaranteeing their security. I am confident that through joint efforts we will accomplish a great deal in this noble and vital endeavour. Thank you. Vladimir Putin: Thank you, Mr President. I will now hand the floor over to President Islam Karimov of Uzbekistan. Islam Karimov: Mr Putin, distinguished colleagues. It is a great pleasure for me to express appreciation to President Vladimir Putin for a traditionally warm welcome and the excellent organisation of this meeting. I would like to add to the earlier opinions with regard to SCO activity during Russia's presidency in fulfilling the key objectives and tasks of the organisation. I would like to specifically emphasise how SCO members focused on the coordination of their activity, the SCO institutions, and preparations for discussions of the most relevant and important issues on the current agenda. The substantial package of documents proposed for discussion deserves the most serious attention: Mainly, the SCO Development Strategy Towards 2025, and an SCO programme to fight terrorism, extremism and separatism for 2016-2018 that will become a reliable legal framework for resolving near-term security and sustainable development issues. If you allow me, I think it is necessary to cover the following issues. First. The rapidly changing world, the growing authority of the Shanghai Cooperation Organisation in addressing topical issues, its transformation into a real guarantor of security, stability and sustainable development are consistently fuelling the interest of many states to become fully functional members of the SCO, observers and dialogue partners. We believe this is a natural course of events. As we have focused more on the expansion and inclusion of more members in the SCO, over the past years, we have adopted a number of regulatory documents in addition to the foundation document, the SCO Charter. They include a process for admitting new SCO members and a regulation on granting an applying state full member status that was adopted in 2014. I support the proposal that we begin to discuss the inclusion of India and Pakistan in the SCO as full members. I am very pleased to say the very phrase "full member" of the Shanghai Cooperation Organisation exactly because it is very important to differentiate between observers and full members. From this point of view, these two powerful countries can expect to take advantage of this great opportunity. I would like to stress once again that we are fully aware of what it means to these countries if the decision is positive. We also support the granting of observer status to Belarus and the status of dialogue partner to Azerbaijan, Armenia, Cambodia and Nepal. I would like to focus on the second issue, and I believe it's necessary to discuss this: the question of maintaining and strengthening an important phrase that we have included in the charter, as well as in all fundamental SCO documents, the phrase stating expressly that SCO activities are not directed against other countries. In other words, we need to rule out any bloc mentality or the conversion of the SCO into a military-political alliance, to preserve and further strengthen our commitment to those principles and goals under which the SCO was initially established. I'm sure that this issue is now gaining greater significance owing to the fact that, in our modern age, political and economic confrontation and the struggle for spheres of influence is becoming more intense, the threats and challenges of international terrorism and extremism are increasing, and, as I mentioned, the slow expansion of radicalism continues. I would like to dwell briefly on the third issue - the situation in Afghanistan. As we see it, the situation could be described as a sluggish confrontation between belligerents. Continuing in this direction is fraught with a serious danger, real danger, I'd say, of spreading instability to other countries and regions. Our regional countries and Afghanistan's neighbours cannot help worrying about this and feeling concerned. When problems are not addressed for a long time, they generally grow and become more dangerous. We are firmly convinced (and history shows this) that there is no military solution to the Afghan problem. Basically all leaders of regional countries and most of the world agree with this now. Peaceful political talks, the attainment of a domestic consensus between the parties, with financial, economic and humanitarian support from other countries and the involvement of the United Nations are the only solutions to the Afghan problem. We are concerned about the rapid withdrawal of ISAF units from Afghanistan, something that could seriously escalate a threat, increase instability in Afghanistan itself and beyond, promote the expansion of terrorist extremist activity and more illegal drug trafficking. Under these conditions, it's possible that the current vacuum in Afghanistan could be quickly filled with various radical terrorist forces and cause the situation to develop like the Iraqi scenario when the so-called Islamic State emerged in a power vacuum. Regarding the Islamic State, I'd like to say that many people are discussing it, but no one has yet uncovered the roots of this terrorist organisation. Furthermore, I believe that the UN would do well to create a special commission that would gather different opinions from experts on the Muslim world who are aware of the disputes and diverse opinions on this issue. I think that this commission could draw up proposals and offer them for discussion in order to shape a common opinion on the essence of the Islamic State and ways to fight it. I want to say one thing and to raise one point here. All discourse on Muslim fanaticism, as it's called, and international terrorism based on it seems to indicate that international terrorists are invariably Muslim, as we see from examples in Europe. However, I believe that the less we uphold this lopsided view, the sooner we'll find common ground with those who seem to come from the most fanatical part of the Muslim world. The Muslim world has been torn apart by internal contradictions since its establishment and by various branches that have been fighting each other since the 7th or 8th century. We should be guided by one opinion only: we must support traditional Islam and reject all kinds of fanatical Islam. It is this policy that the UN should approve. Islam is a global religion, and fighting Islam, in my opinion, is nonsensical. Instead, we must analyse its inner developments. What are the reasons behind these trends? It is this issue that we must address as a priority. We need to shape a common opinion, not live in fear of terrorists breaking into our homes. What is happening in the world, and how can we stand up against these developments together? Unfortunately, we have not made any considerable progress in this sphere. As a neighbour of Afghanistan, Uzbekistan continues to provide any help it can, building transport infrastructure, supplying electricity and delivering humanitarian aid to the Afghan people. Uzbekistan will continue developing bilateral relations with Afghanistan based on mutual national interests and respect for the Afghans' choice. Colleagues, the Republic of Uzbekistan will assume an important position - the SCO presidency - in the coming year, when we mark the 15th anniversary of our organisation, which should enhance our shared responsibility for the successful implementation of future plans. Uzbekistan, as the presiding state, intends to strictly adhere to and abide by the principles of succession and will focus on further strengthening and developing mutually beneficial cooperation that meets the interests of the SCO member states and promoting our organisation's authority on the international stage. Our main task and goal will continue to be the development of measures to strengthen our joint efforts against terrorism, extremism and separatism, the preparation of relevant responses to modern challenges to international and regional security, and the sustainable economic and humanitarian development of the SCO member states. Great importance will be attached to expanding cooperation between the SCO member states in order to strengthen the organisation's role as a reliable guarantor of stability and development in the region, as well as promoting relations with the UN, other international organisations and interested countries. We believe that today's reality dictates the need to step up the investment component of the SCO, especially in high-tech sectors. In this regard, we cannot but say words of gratitude to the People's Republic of China for its tangible contribution to the development of investment processes and projects. All of the SCO member states supported the initiative of China's leadership to establish the Asian Infrastructure Investment Bank. We hope that this newly created bank, guided by the principles of economic rationale and feasibility, will ensure the efficient preparation and implementation of promising regional investment projects in the transport, communications and other high-tech industries. As part of its SCO presidency, Uzbekistan is going to pay close attention to encouraging efficient regional cooperation in the cultural, humanitarian, scientific and educational fields. In implementing our plans for the next year, I am looking forward to our collaboration and the support of all the heads of state and relevant bodies of the SCO. 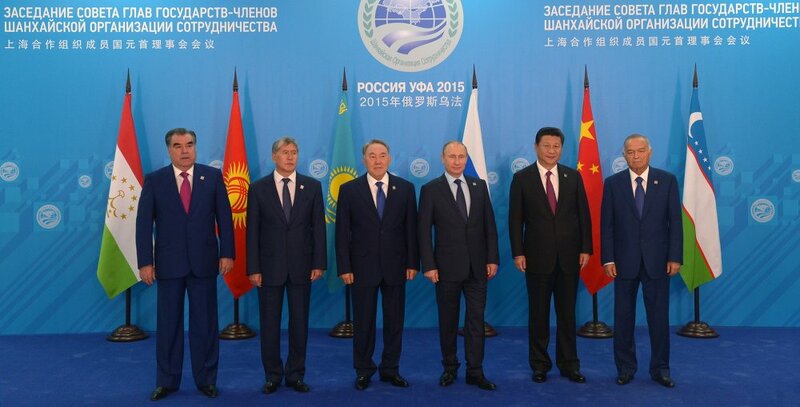 As for the date of next year's summit, the SCO member states unanimously decided to hold it in early September 2016. Since next year's realities may change, the exact dates will be determined based on actual developments next year. Thank you for your attention. Vladimir Putin: Thank you very much, Mr President. I would like to give the floor to the SCO Secretary-General, Mr Mezentsev. Dmitry Mezentsev: Thank you. Mr Chairman, heads of state and delegations. First of all, let me share the words of sincere gratitude to the host, and thank Russian President Vladimir Putin and the entire team of the Russian Presidency for creating these wonderful conditions for our joint work. The participants in the summits will remember the warm welcome and the hospitality of the leaders of Bashkortostan and the residents of Ufa. The meeting of the Heads of State Council is the main SCO event. The leaders of our countries made a thorough analysis of the situation in the region and the world. The assessments that were voiced today are of special significance for us, for the SCO Headquarters and the Regional Anti-Terrorist Structure (RATS). The report on SCO activities after the Dushanbe summit, submitted by the Secretary-General to the heads of state, confirms that during the past year of the Russian Presidency much has been done to further consolidate the SCO, promote cooperation between its members and enhance its international prestige. I'd like to make a few points about a number of practical issues in SCO activities without repeating the report's provisions. The finished draft of the SCO Strategy Towards 2025 confirms that the creation stage of the SCO is largely over. Basically, endorsement of this document will motivate the heads of state to raise their cooperation to a new level, especially considering SCO expansion prospects. The draft strategy notes that the world is facing increasing challenges and threats, factors of uncertainty and unpredictability; regional and local conflicts remain unsettled and new hotbeds of tension are emerging. An incomplete settlement in Afghanistan and the rapid growth of the ISIS terrorist group and other similar organisations are compelling the SCO to enhance its security cooperation. It is necessary to increase the role of the RATS and charge it with new functions. The illegal use of the information space and cybercrimes are also a source of growing concern. In this context the SCO member countries have distributed a draft code of conduct for information security as an official UN document. One of the most important areas of activity for the SCO is to develop relations with international organisations and associations. In November 2014, the UN General Assembly, at its 69th session, passed a substantive large-scale resolution on cooperation between the UN and the SCO, which will help the SCO expand and position itself as an observer at the UN, promote closer involvement in the institutions, programmes and foundations of this global organisation, and increase current cooperation with the UN Development Program (UNDP) and the Economic and Social Commission for Asia and the Pacific (UNESCAP), the UN Office on Drug and Crimes (UNODC) and the Center for Preventive Diplomacy for Central Asia (UNRCCA) in Ashgabat. In May, UN Secretary General Ban Ki-moon met with the executive officials of regional international organisations. The discussion revealed that today the UN is ready to borrow, on a wider scale, from the potential and experience of regional organisations in conflict prevention and resolution and in maintaining security and stability. We attach significance to strengthening partnership relations between the SCO and other associations that have already been formalized, specifically ASEAN (Association of Southeast Asian Nations), the CIS (Commonwealth of Independent States), the Economic Cooperation Organisation with the headquarters in Tehran, the CSTO (Collective Security Treaty Organisation), and the Conference on Interaction and Confidence Building Measures in Asia (CICA). Working on the instructions of the heads of state, cooperation with the observer countries has been brought to a new level. Just one example of this is a major meeting of the national security council secretaries of the member states and the observer countries that took place in Moscow in April. New cooperation mechanisms with the observer states at the national coordinator level under the "6+5" formula have been formed, and inviting the observer states to the majority of the eighteen meetings of the ministers and heads of departments of our countries has become common practice. We suggest expanding the practice of holding SCO events in the observer states and dialogue partner states. We already have some positive experience: in 2010, the capital of Mongolia successfully hosted a meeting of the SCO Business Council, and Belarus has proposed that it host the sixth meeting of the transport ministers in 2016 in Minsk. The SCO has significant trade, economic and investment potential. Fulfilling the instruction given by the heads of government, an inventory of the Intergovernmental Programme of Economic Cooperation has been launched, and a new version of the Measures on Project Activity Development for 2017-2020 is being prepared. It's important to select an optimal number of mutually beneficial and concrete projects, and focus our joint efforts on their implementation. Practical economic cooperation within the SCO must include the agenda of a quickly expanding new association - the EAEC - and the ambitious initiative of President of China Xi Jinping regarding the construction of the Silk Road Economic Belt. It is also important to include the launch of a major project, which is the Asian Infrastructure Investment Bank co-founded by all SCO member states. We believe this would help us clarify the positions of the parties, which are now busy forming and have for a long time been working on developing approaches towards creating the SCO Development Bank and the SCO Development Fund. Having signed an intergovernmental agreement on facilitating international motor transport in September 2014 in Dushanbe, the organisation confirmed that the parties are willing to combine their national interests with the interests of the organisation. The implementation of the Russian initiative on preparing joint proposals about combining the national motorway development programmes of the SCO member states may provide an impetus to building infrastructure within the SCO. The SCO Business Forum held during the St. Petersburg International Economic Forum for the fourth time this year confirmed the traditions of cooperation existing in our business community under the auspices of the SCO Business Council. Holding, upon the initiative of the Chinese side, of an exhibition of products manufactured in all 14 countries of the "SCO family" will be another major event. All of these countries will attend the Eurasian Economic Forum. The first meeting of ministers in charge of foreign economic activity from 14 SCO countries will take place there in September. The SCO Charter provides for promoting regional cooperation. This year, upon the initiative of the Chinese side, we plan to organise, just as in Harbin last year, a roundtable of regional heads of member states, which could eventually become the basis for establishing a new public institution - the Regional SCO Council. We would like the heads of state to support this approach. The year 2015 is special. It marks the 70th anniversary of Victory over Nazism in World War II. The declaration to be adopted today will be an important confirmation of the joint position of the heads of state and a symbol of preservation of the proper historical memory of the great feat accomplished by the nations that defeated Nazism. Today, the heads of state will appoint a new SCO secretary general, who will take office on January 1, 2016. Please join me in wishing every success to Rashid Alimov in his work for the benefit of our organisation. For my part, I would like to express my special appreciation for their continued support to the heads of SCO member states throughout the work of our team and my work. I would like to thank the presidents of the SCO member states and the Russian President for the faith that they put in me when I was appointed to this position at the 2012 Beijing summit and for the opportunity to be part of the activities of such a dynamic organisation. Thank you for your time and for the privilege to speak here. Mr Zhang Xinfeng, Director of the Executive Committee of the SCO Regional Anti-Terrorist Structure (RATS), please go ahead. Zhang Xinfeng (via interpreter): Mr President Putin, heads of states and colleagues. Over the past year, the concerned agencies of the SCO member states have adopted effective measures within the framework of the RATS to respond to threats and challenges and to protect regional security and stability. The RATS Council has already reported its performance to the SCO Heads of State Council. Therefore, I will only report briefly on this. First, we need to strengthen the practical collaboration of the SCO member states in the fight against the three evil forces. The Islamic State, the Islamic Movement of Uzbekistan (aka Islamic Movement of Turkestan), Hizb ut-Tahrir, the East Turkestan Islamic Movement, and the Islamic Jihad Union, constitute the biggest threat to the SCO member states. The RATS have been redoubling efforts to analyse the situation, exchange information, hunt down criminals, conduct joint security operations at major social and political events, exchange opinions, and jointly train personnel. We have also created a task force to fight the three evil forces. In 2014, the concerned agencies of the SCO member states prevented 317 terrorist and extremist attacks, arrested 333 suspects, shut down 391 terrorist training bases, eliminated 650 terrorists, and seized a large amount of weapons, munitions, and improvised explosive devices. Second, we must fight the use of the internet by the three evil forces for subversive purposes. Terrorists have created several propaganda agencies that post audio and video material online. They also use the internet to transfer information, collect funding, recruit new members, and expand their terrorist activities. With the coordinating role of the RATS, the SCO member states have created a cooperation mechanism for preventing the three evil forces from using the internet, as well as a legal framework for the operation of a joint expert group for monitoring the online operation of the three evil forces, in a bid to promptly pinpoint such activity and to bring it to the leaders' attention. To date, the RATS Executive Committee has issued 106 informational statements regarding the online activity of the three evil forces. The agencies of the member countries concerned - acting in strict compliance with their national legislation - have ordered the deletion of over 4,800 photographs, 3,100 video clips, 320 audio clips, and 8,000 e-literature publications, and blocked access to 160 sources of information believed to incite terrorism and religious extremism. In October of this year, we plan to hold the first joint cyber exercise. Thanks to the coordinated activity of the RATS, the member countries have exposed and foiled the attempts of the three evil forces to use the internet to proliferate harmful information in the SCO region. These efforts have had a visibly positive effect. Third, we must actively resist the involvement of the SCO member states in armed conflicts in the zones where there is terrorist activity. Citizens from all of the SCO member states have taken part in armed conflicts in zones of terrorist activity. Those of them who return home pose a threat to our region. Acting in compliance with the RATS Council decisions, the SCO member states have adopted a series of targeted joint measures to apprehend several international terrorist groups who have recruited new members in the SCO region and shipped them back to the zones of terrorist activity. The RATS Executive Committee has accumulated information about these individuals for information exchange. We have files on 3,000 militants. Fourth, practical cooperation continues to develop between the border services and law enforcement agencies of SCO member states. A mechanism of border cooperation has been established in the RATS framework to guarantee security on borders and prevent the supporters of the three evil forces from infiltrating the territories of SCO member states, as well as the smuggling of weapons, ammunition, explosives and drugs. Each year, the heads of the border services hold conferences to discuss specific issues of practical cooperation. Joint border operations and exercises are held in line with the procedure for organising and holding joint border operations. In the past three years, a draft agreement for cooperation on border issues was drafted with the active involvement of the sides for submission for signing by members of the SCO Heads of State Council. Its signing will serve as an important legal framework for maintaining border security of our countries. Fifth, we need to actively promote cooperation with SCO observer states and international organisations in the struggle against terrorism. The SCO has a unique lineup and geopolitical potential. To counter various threats and challenges, member states and observers need to cooperate by regularly holding research and practical conferences as regards cooperation in combating international terrorism and extremism. The sides are exchanging opinions regarding regional security and formulating a mechanism of cooperation, while the signing of cooperation protocols between the RATS and law enforcement agencies in SCO observer states is making rapid headway. In May, a RATS delegation visited Afghanistan and signed a protocol of intent with the Afghan side. The RATS continues to coordinate the signing of protocols with other SCO observer states and dialogue partners. At the same time, we are actively involved in international anti-terrorist cooperation under the auspices of the UN. We have established close cooperation with professional anti-terrorist agencies, including the UN Security Council's Counter-Terrorism Committee, as well as other international regional organisations, such as Interpol, the Collective Security Treaty Organisation, UN Regional Centre for Preventive Diplomacy for Central Asia, Europol and OSCE. Ladies and gentlemen, the RATS continues to expand its potential, to boost its efficiency and enhance its international authority in response to the changing international and regional security situation. Last year, permanent representatives of Kyrgyzstan and Tajikistan started working at the RATS. Previously, the staffs of the permanent representatives of Kazakhstan, China and Russia were established. This improved the mechanism of contacts and coordination between the RATS and the sides' law enforcement agencies. In this connection, I would like to thank the sides for your support. We hope that the sides will support the activity of our structure to maintain regional security in the future. Thank you for your attention. Mr Mohammad Ashraf Ghani, President of the Islamic Republic of Afghanistan, you have the floor. Mohammad Ashraf Ghani (via interpreter): First, let me thank Mr Putin for the summit's perfect organisation. I would like to thank the founding members of the SCO for the effective work you've done and for showing us that an organisation like the SCO is very important for us at this moment. We believe that the SCO has helped us resolve very important issues and expand Afghanistan's influence. I would also like to thank you for the decision to admit India and Pakistan in the SCO. I believe it's a wonderful idea and will make the SCO more effective. I would also like to thank the Head of the Republic of Bashkortostan for doing a wonderful job of organising the event. I would like to make some brief remarks. First, there are two things I would like to note. How is Afghanistan perceived in the world today? It is seen as a source of threats and instability, a country with drug trafficking and terrorism. But Afghanistan is also perceived as a country where most government officials got their jobs through democratic elections. Afghanistan can also be seen as a source of prosperity in the region, as a country with abundant mineral resources, water and energy resources. Yet, the tragedy is that rich as it is, Afghanistan has to deal with the poverty of its citizens who have to overcome enemies in their own country and abroad. I believe that we must use every opportunity to fully mobilise our resources and potential. Our two main enemies are terrorism and the illegal drug trade. What are the roots of terrorism? First, many terrorists come to our country and use our territory to destabilise your countries and other countries in the region. We must acknowledge the roots of this problem, and that these people have no problems with the Afghan government. They are not fighting against the Afghan government, they just use our territory to destabilise the situation in the region. We have to recognise this important fact in order to address this problem effectively. Terrorists from Central Asia, China, Pakistan and Russia use our territory, use our state for their purposes. There are also terrorists from countries of southern Africa, Saudi Arabia and countries of the Middle East who use our country for their purposes. This is our common enemy. Our second objective is to combat drug trafficking. We should fight drug producers, drug dealers and those who run transport networks for drug trafficking, as drug traffickers are as much of a problem as drug producers. The UN Office on Drugs and Crime has recorded this in its documents, and there is no doubt about the need to fight drug trafficking because it provides a source for financing terrorism. Furthermore, we are pleased to tell you that over the past three days we have effectively fought the Islamic State and eliminated two of its leaders. I should add that 120,000 soldiers in our country are engaged in fighting terrorism, and we are doing everything that we can to defeat our common enemy. Regarding the shortcomings, I would like to say that there is a problem related to air support. The international component is vital for combating terrorism. We need to pursue a single regional strategy to overcome the problems that we are faced with - problems that pose a threat to the entire region. For this reason, we would like to propose the following. We should achieve closer cooperation in the fight against terrorism. What is of key importance here is the sharing of intelligence, the exchange of security information, joint analysis and cooperation. Furthermore, we also need a joint system, a common framework document on data verification. We need to know exactly where these people come from, who finances them and who benefits from their activity. These aspects enable us to effectively fight terrorism. I would like to thank the governments of Pakistan, China and the United States for helping us hold our first direct talks with the Taliban. It is important to understand that psychological shifts should lead to changes on the ground, which requires a political framework for the peace process because this is in the interests of Afghanistan. We should be actively involved in this work and we want to continue this work. Regarding our counter-drug efforts, I can say that these efforts have not been sufficient. We would like a common, substantive agenda to be developed, one that would be recognised by all. Tonnes of drugs are trafficked to different regions. This means that there are serious security lapses in countries where drugs are produced, in countries where they are consumed and in transit countries. We would like to create an effective framework for meeting all of these challenges. We propose that a ministerial meeting be held in Kabul as soon as possible to share information, develop a common plan of action, and assume certain obligations in fighting these threats. Afghanistan wants prosperity for its people. We have gone through and sacrificed a great deal, and we would like to avoid such losses in the future. I would like to congratulate the next SCO president. We will work together to achieve effective results. Thank you. Vladimir Putin: Thank you, Mr President, for your information and for you proposal. Prime Minister Modi of India, please. Narendra Modi (via interpreter): President Putin, I'd like to thank you for organising this meeting with the invited states. Thank you for inviting India to take part in the SCO plenary meeting. I'd like to give my best regards to you on behalf of India's 1.25 billion population. I'd also like to thank the SCO for accepting India in their ranks as a fully fledged member. This reflects the natural course of history and will promote peace and prosperity in the vast region that has played a major role in the history of all humanity. It will promote our common vision aimed at Eurasia's integration. India is a spiritual, cultural, economic and political centre for forging ties with Eurasia. These ties date back to ancient times and are helping all of us. The political landscape of the region is undergoing a serious transformation, and India is restoring friendly ties with Central Asian countries in the process. I have recently visited all five Central Asian countries, which shows how important they are to us. India is also deepening its strategic cooperation with China and Russia. Our SCO membership is a logical continuation and development of the established relations. Together with other countries present here, the SCO may become a springboard for Eurasia's integration and its transformation into the most dynamically developing region. In the past few centuries, we did not pay enough attention to this region of great potential. It is time for each country in this region to ensure its prosperity. We have all the necessary resources to do so. About two-thirds of the world's population live in our countries. We have natural resources, markets and advanced technology. India is taking an active part in SCO activities as an observer. We highly value our cooperation with SCO partners. We'd like to do everything to promote our ties and human contacts in the region. The North-South transport corridor will help us reach these goals. India would also like to facilitate the development of infrastructure in the region. We will support the efforts to create a favourable environment for removing barriers and developing trade in the region. The vast Indian market will make its contribution to the prosperity of the entire SCO region. India will actively upgrade its human resources and promote the exchange of information, communications technology, and experience in healthcare, small- and medium-sized business development, micro financing, food security and agriculture. The SCO region is home to many different cultures, which allows us to launch youth exchanges that promote unity in our region and beyond. Our region has a fragile environment. At the same time, our countries have a rich natural resource endowment. Therefore, along with our SCO partners, we must address climate change and promote sustainable development. Our future prosperity depends on the peace that we can build in the world. India is willing to work towards this goal. We are willing to cooperate with the SCO in combating terrorism and extremism as these threats are gearing up and becoming increasingly serious for the entire region. A stable and peaceful Afghanistan will become a prerequisite for peaceful future and the people of Afghanistan deserve this future. Peace in Afghanistan will ensure peace and prosperity across the region. Your Excellency, to this end, I would like to say the following: one-sixth of the world population lives in India and it is growing by 7.5% every year. Our country offers unique opportunities for our neighbours. India's dreams can also come true through partnerships with its neighbours. SCO is an important component in this vision. Let me assure you of India's support for all SCO's endeavours. Let me take this opportunity to congratulate Pakistan on its SCO full membership status. I wish you all a successful outcome of this meeting. India will continue to promote partnerships with its neighbours and the countries in the region. I am very happy that we will continue to work on this under the presidency of Uzbekistan. Thank you. Vladimir Putin: Thank you very much, Mr Prime Minister. Now I will give the floor to President of Mongolia, Tsakhiagiin Elbegdorj. Tsakhiagiin Elbegdorj: Dear President Putin, distinguished heads of state and international organisations at this summit, ladies and gentlemen. First of all, I would like to express my gratitude to the President of the Russian Federation, Vladimir Putin, for the successful organisation of the 15th summit of the SCO heads of states, for the warm welcome and the pleasant conditions for our meetings. I am happy to visit Russia again. Our relations with this country have traditionally developed on friendly terms. I would like to specifically note that over the past year, the Russian Government and President Putin have made an important contribution to the strengthening of the overarching collaboration in regional security, economy, culture and education within the SCO and the building of the organisation's authority on the international arena. The main outcome of the Ufa summit will be to adopt a development strategy towarsd 2025, which will set the course for the SCO's development over the next decade. I would like to congratulate all the SCO members on adopting this important document, especially the Russian Federation, for its successful SCO Presidency this year, and for the significant contribution to expanding cooperation in all areas of the group's activity. As part of our policy of actively participating in international cooperation in Central Asia, our country in 2004 became the first to be granted observer status with the SCO. Over the past 11 years, we have attended the heads of state and government meetings, ministerial meetings and other events as much as possible. To further expand and intensify our involvement, we will study the SCO Development Strategy towards 2025 and will cooperate with the member states to help implement it. Broadening mutually beneficial economic cooperation is the most effective way of ensuring regional security. That is why in recent years the SCO has been emphasising the economic component of its activity and taking specific practical measures, which are, in turn, very important for Mongolia. Mongolia is coordinating its Steppe Route project with the Silk Road Economic Belt, referred to as the Sino-Mongolian-Russian economic corridor. We are also interested in cooperation within the framework of the Trans-Eurasian corridor. Mongolia's geographical location and the growing volume of regional freight traffic create favourable conditions for the development of transit shipments. I would like to express my gratitude to the SCO members for inviting observer countries to participate in the group's activities. This created a 6 + 5 format, which includes the observers, thus expanding the area where we can be active and contribute to the common cause. One example of such cooperation is the participation of observer countries in the SCO National Security Council Secretaries Meeting. Within the framework of the SCO, our country is interested in participating and cooperating in many areas, in particular infrastructure, agriculture, culture, environmental protection, and disaster management projects. To this end, our country is watching the implementation of the multilateral trade and economic cooperation development programme and exploring opportunities to participate in it. In this regard, work is underway to update this programme. I would like to repeat our proposal to add to it projects that can be implemented in cooperation with observer countries and dialogue partners, and involve them in working on the document. In an effort to invigorate its SCO activities, Mongolia is striving to enhance its involvement in the Energy Club, as well as its capacity to take part in the activities of the SCO Development Bank and the Special Account to Finance Joint Projects. Ladies and gentlemen, yesterday, on July 9, the second meeting of the heads of Mongolia, Russia, and China was successfully held. The meeting participants discussed promising avenues of cooperation between Mongolia, Russia and China, as well as took several specific decisions. Documents stipulating cooperation between the three states were signed, thereby creating the legal framework of the trilateral cooperation. It is with this in mind that I'm happy to note that Mongolia has taken a major step in its contribution to regional development. In terms of expanding cooperation, I believe that this mechanism of trilateral cooperation could serve as an example for other countries in the region. Mongolia is particularly focused on the mutually beneficial and fruitful cooperation in the areas of infrastructure, investment, and transit traffic with SCO member-states and observer states, especially with our neighbours - Russia and China. Mongolia strives to actively participate in regional and international activities and to make specific contributions. Preparations are underway to hold the 11th summit of the Asia - Europe Meeting in Ulan-Bator in July 2016. Moreover, Ulan-Bator will host the autumn session of the OSCE Parliamentary Assembly on September 15-19 of this year, and we hope that SCO member-states will send their official representatives. Mongolia strives to strengthen relations with SCO countries and to use the fruits of this cooperation for the benefit of its citizens. Vladimir Putin: Thank you very much, Mr President. Mr Muhammad Nawaz Sharif, the Prime Minister of the Islamic Republic of Pakistan, you have the floor. Nawaz Sharif (via interpreter): Your Excellency President Vladimir Putin, heads of state and government, ladies and gentlemen. It's a great honour and pleasure for me to speak to you at the SCO Summit. I'd like to thank President Putin for the hospitality shown to me and my delegation. I'd like to thank SCO Secretary-General Dmitry Mezentsev for his efforts consolidate this organisation. Esteemed participants, we stand at a turning point in the history of the SCO, which has started the process of admitting new member states - India and Pakistan. I'm convinced that the expansion of the SCO will more accurately reflect the changing geopolitical landscape of the region. The main principles of the SCO Charter are sovereign equality of states, respect for territorial integrity, and promoting cooperation and security. The SCO spirit is opposed to hegemony in international affairs and promotes trust between its member states. President Putin gave a brief account of the SCO's activities and the new trends in its development. Ladies and gentlemen, as a major SCO member Russia stands at the crossroads of Europe and Asia. The recent initiatives on the integration of the Silk Road economic belt with the Eurasian Economic Union will expand the economic reach of the SCO Member States. The Chinese President is responsible for this unprecedented initiative. It will bring the region's countries closer together and create unprecedented resources for the good of our countries. Pakistan is focused on receiving the status of full member in the SCO. We have common values with the SCO countries, as well as cultural and historical ties. We also have similar approaches to a host of regional and international issues. Pakistan has important ground and sea routes that will promote contacts in the SCO region and beyond. Pakistan's participation will connect Eurasia with the Arabian Peninsula. We are committed to maintaining peace in Afghanistan and Central Asia, which will facilitate the development of trade and security throughout the entire region. In the geopolitical context we must work together to combat the threat of terrorism, extremism and drug trafficking. Activities aimed at countering terrorism and enhancing border security will help us achieve these goals. This will make it possible to ensure peace in Afghanistan and the rest of the region and facilitate the development of mutually beneficial economic cooperation between the SCO Member States. Ladies and gentlemen, in conclusion, I would like to point out that we, the SCO partners, have an ambitious programme of action to fulfill. We must ensure regional stability and promote further economic integration in order to achieve the goals we have set for ourselves. We must work together to overcome our differences, find solutions to territorial disputes, and create a favorable environment for the benefit of all our nations. This meets the true spirit of the SCO. I would like to join our respected colleagues in congratulating President Karimov of Uzbekistan on assuming the SCO presidency next year. Vladimir Putin: Thank you so much, Mr Prime Minister! Mr Jeffrey Feltman, the UN Under-Secretary-General, has the floor. Jeffrey Feltman: Your Excellency Mr President! Ladies and Gentlemen! Thank you very much for inviting the United Nations to participate in this important session. I am honored to convey a message from the UN Secretary-General Ban Ki-moon. "I am pleased to send greetings to all participants at the Council of Heads of State of the Shanghai Cooperation Organization (SCO). "The SCO plays an important role in fostering cooperation to maintain peace and stability in Eurasia. Your region faces many dire challenges, including extremism and terrorism, drug trafficking and organized crime. We all hear troubling reports of men and women from this region joining violent extremist groups fighting in the Middle East. No State can confront such challenges alone. "Renewed fighting has recently been testing the authorities in Afghanistan as a changing security environment adds new strains. Afghan [National] Security Forces have shown resilience and the Government is resolute in pursuing peace. With the accomplishment of historic transitions last year, Afghanistan has entered its transformation decade, taking full leadership and ownership in its national affairs. "I commend the support provided by the SCO and its member States for the advancement of security and stability in Afghanistan. Such regional support is more crucial than ever to enable further progress in all areas, from security to economic development. "The United Nations and the SCO share many goals, including a peaceful and prosperous Eurasia. Expanding and deepening cooperation within the SCO and between the SCO and other regional and international organizations will help us to achieve our common aims. "I take this opportunity to highlight a new United Nations plan of action on preventing violent extremism which I will present to the General Assembly later this year. I count on your support for this initiative, which will aim to boost international cooperation to confront this dangerous threat. "The United Nations is committed to furthering cooperation with the SCO through our various agencies and the UN Regional Centre for Preventive Diplomacy for Central Asia. I look forward to strengthening our partnership for peace, security and prosperity, and wish you great success." That was Secretary-General Ban Ki-moon's message. Vladimir Putin: Thank you very much. Please, Mr Le Luong Minh, Secretary General of ASEAN (Association for Southeast Asian Nations), you have the floor. Le Luong Minh (via interpreter): Your Excellency President Putin, Chairman of the plenary session of the SCO Heads of State Council, SCO member-states, observer states, dialogue partners! I would like to thank His Excellency President Putin and the Russian Government for the invitation to represent ASEAN at this extended SCO plenary meeting. Ladies and gentlemen, since its establishment, the SCO has promoted the peace, stability and prosperity of its members. Practical cooperation with neighbouring organisations and organisations across the world, including with ASEAN, is intensifying. With this in mind, I would like to congratulate President Putin, the Russian Government, and the SCO Secretary General on successful Presidency and the excellent management of this event. Ladies and gentlemen, according to the Southeast Asian idea of society, human beings are the centre of everything. Political security, and economic and social stability are our goals. We seek peace, stability, and prosperity across the entire region. By the end of this year, we hope to bring into action a practical programme, a plan that will meet the expectations of our members and help exercise the fundamental principles of international law and international relations, in addition to ensuring long-term peace, stability and security for all the countries in the region in the collaborative spirit of Southeast Asia. In addition to ASEAN, there will be 22 negotiating parties. Working with our partners, we must play an active role in developing dialogue and cooperation, in the regional mechanisms that were discussed at the East Asia Summit, and also at the Asian Defence Ministers Meeting with the participation of SCO members. We are looking ahead and intend to improve our cooperation after 2015 in order to cope with the current and emerging threats and challenges, and build a violence free society that would adhere to the principles of peace. We believe that closer interaction between the SCO and ASEAN will help us ensure lasting peace, stability, and wellbeing for all the member-states of our two organisations, which, we are certain, will continue making their contribution to peace and prosperity in the region and beyond. We have confirmed that we face common challenges. The SCO and ASEAN have identified the areas of priority cooperation - specifically, different aspects for preventing transnational crime, terrorism, drug trafficking, money laundering, and arms smuggling. We are also working together in areas such as tourism, energy, natural resources, and social development. We would like to work with the SCO members on unlocking the potential of our partnership for the benefit of our nations. I would like to wish us all good luck in doing this. Vladimir Putin: Thank you very much. Now I would ask Mr Ebrahim Rahimpour, Deputy Minister of Foreign Affairs of the Islamic Republic of Iran, to say a few words. Ebrahim Rahimpour (via interpreter): In the name of Allah, the Almighty and All-Merciful, I would like to thank the Russian Federation for the wonderful organisation that went into this meeting and for the plenary meeting of three organisations held yesterday. My country is in a very important stage of negotiations for the peaceful resolution of an issue of ours. My friends here have wished us success and prayed for this, and I'm very grateful to everyone. The President and Minister of Foreign Affairs of my country are involved in holding these negotiations which are the most important international negotiations of the 21st century. We are striving to achieve a comprehensive, fair agreement that would ensure global peace and security, our region in particular. I would like to congratulate Uzbekistan on its upcoming presidency of the SCO next year. We think Islam Karimov's proposal to celebrate the organisation's 15th anniversary next year is a good idea. And this organisation will certainly continue to move forward. The policy of the Government of Iran calls for the comprehensive development of relations with all countries, including our 15 neighbours. From this standpoint, half of this organisation's members and observers are our traditional neighbours on the land and on the sea. Therefore expanded trade, transit, as well as integration and sustained security, are the three pillars of this organisation, so to speak. Regarding trade, members of this organisation are currently responsible for 70 percent of our trade. In 2014, our trade accounted for about $90 billion. This means that we are addressing this important issue in this organisation and, certainly, relations with these countries will expand after the end of the oppressive sanctions that were imposed on us. Transit is the second issue meriting attention of this organisation. During its millennia-long history, Iran has cooperated on the Silk Road and other corridors. That is why we supported the initiative of the President of the People's Republic of China. And we have always been actively involved in the proposals from the People's Republic of China. As for security, the third issue which is also vitally important for this organisation, we are also playing a very important role in ensuring security in the countries of the region and beyond. They are perfectly aware of our potential and capabilities. People from some 60 countries, which are located far outside our region, are involved in the activities of the "Islamic State" organisation. The "Islamic State" is not traditional Islam and has nothing to do with any other religion. This organisation was created by large powers. In the east of my country, the Taliban operates - this organisation was created to oppose the Soviet Union, and was used on September 11, 2001 against the forces that created it. We suffered significant losses - both human and financial - in our fight against drugs and drug trafficking across Iran. We are also taking great effort now to prevent the "Islamic State" from joining the Taliban. We support a moderate religion, Islam, which calls for peaceful coexistence. We condemn any assistance to extremist forces or help to achieve their political and military goals. I am very glad that good ideas were proposed at this meeting, ideas to create adequate conditions for citizens' well-being. We see it as a way of ensuring security and peaceful coexistence. We are very glad about the start of the process of accepting new members. This will promote greater peace in this region. The Islamic Republic of Iran sees that BRICS, the SCO and the Eurasian Economic Union have good potential for the countries in the region and outside. We declare our readiness for a greater partnership to achieve the high goals of this organisation that His Excellency Mr Putin and Mr Karimov have spoken about. We declare our readiness for this. Thank you very much. Vladimir Putin: Thank you, colleagues. Here among our guests we have representatives of several other international organisations - CIS, CSTO and the Conference on Interaction and Confidence-Building Measures in Asia. I would like to thank them all for their participation. In general that concludes our agenda for today. Now we have to proceed to singing the final documents. I would like to address all the participants of our meeting. Do you have any more comments, remarks, additions, or some additional information? No? Thank you and members of your delegations for your joint efforts. We will now proceed to singing the final documents.